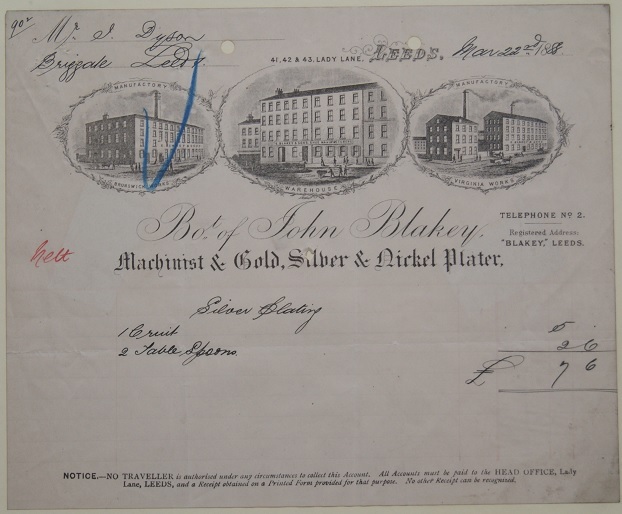 The bill, dated 22nd March 1888, is for silver plating. Mr. J. Dyson, Briggate, Leeds. The Mr. Dyson in question was John Dyson, a Jeweller and Watchmaker, who opened up his splendid premises, 'Time Ball Buildings', 24, 25, 26, Briggate, Leeds in 1865. Although the business finally closed in 1990, the shop-front, including it's huge clock still remains as a landmark in Leeds today.